Death Valley National Park – Did i catch the Super Bloom? There are fewer places on earth that have left a more indelible impression on my psyche than the Death Valley National Park in California. Well known for seeming endless roads, some of the most hostile environments in the continental US, and terrains that defy all that we know about life, Death Valley is named with accurate precision. A couple of hours from the mirage that is Las Vegas, this ominous landscape reminds us how ephemeral yet ever-lasting life’s journey can be. Ever since i first saw brilliant images of the elusive wildflower “Super Bloom” from perfect conditions back in 2016, i wanted to witness the phenomenon first-hand. Partly circumstantial, and part by design, i meticulously planned a solo-trip earlier this year during the forecasted spring weeks to catch it. I religiously read multiple blogs, tracked numerous daily updates from other bloom catchers, and left no stone unturned to make it happen. So did i catch the bloom? Follow my journey into the Death Valley to find out. The day started at the crack of dawn. Promptly loaded up on Caffeine and the anticipation of psychedelic sights, the next 10 hours didn’t disappoint to say the least. Desert Cacti welcome you into the wild wild west country-side. And so do distant parties of peaks formed by millions of years of gritty winds and scorching heat. The first point on the adventure is the Zabriskie point. A perfect field trip for any geography lesson on erosion. I spent more time that i had slotted for this point, but then again, my eyes were parched for the sights i was witnessing. The panorama opens up to the Furnace Creek lake which dried up 5 million years ago to leave the eroded sedimentary rocks in its wake. The solitude is palpable against the rising sun behind as you wave to millions of years of the lake’s bedrock wisdom. As you peel yourself off this point to the Golden Canyon Hike, a new sense of reveal awaits you. Solitary hikes in the Golden Canyon can be confusing and loopy. Make sure to download Offline Google Maps and follow marked trails. Soon after you are directed to get painted by a series of hills in pastel hues, colored by oxidation & weathering, along the Artist’s Drive loop. Disclaimer: Watch out for passing vehicles before trying selfie stunts in the middle of the road. Roads get roasted to 120F temperatures and tire bursts are very common. Absolutely recommend paying for roadside assistance with your SUV rental. And most importantly, pump a FULL tank of fuel before entering the park at Death Valley Junction. As you can tell, there is no help for miles. From the impressionists to the Satanic era, next on the menu is where only the Devil would dare play golf. The Devil’s Golf Course is a large salt pan on the floor of Death Valley, located in the Mojave Desert within Death Valley National Park. 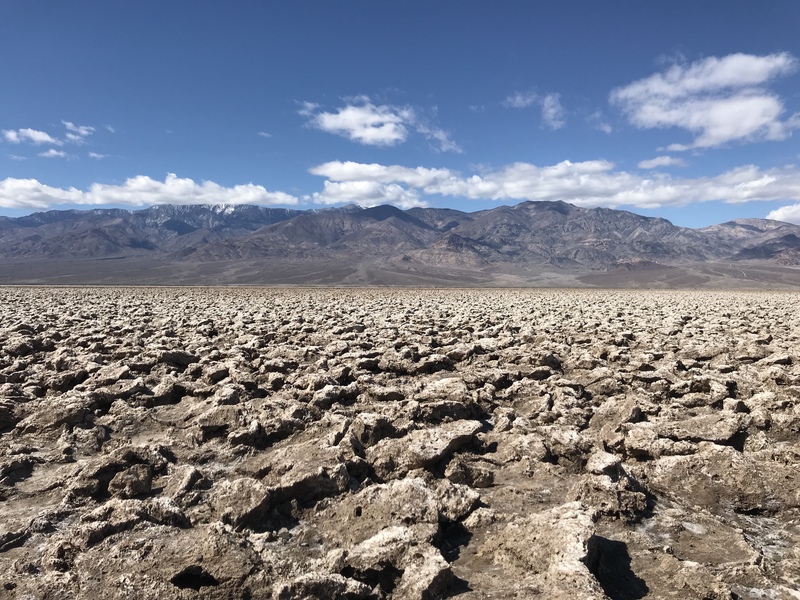 From the Devil to deep sea, the Badwater Basin is an endorheic (right click, look up 🙂 ) basin in Death Valley National Park, noted as the lowest point in North America, with a depth of 282 ft below sea level. Standing in the middle of it all reminds you how insignificant your time on earth is in comparison to everything else that has been and will be. Of course, where there was once a sea, there will be sand too. A few miles on, Mesquite Flat Sand Dunes open up to a vast area of mountain-fringed sand dunes reaching 100 ft. So did i find the super bloom? Not quite, turns out 2016 was the only year it was perfect conditions for the rare phenomenon. Honestly, by the end of the day, i had forgotten all about it. If in life, one could do everything that was planned, how would there be room to stumble upon anything else that could take our breath away. It would beat the entire purpose of Travel. Do i still plan meticulously for a trip? Of course i do! But do i know exactly how each minute, hour, day will turn out? No, and neither do i want to. It’s the umpteen other possibilities that could play out instead that make life worth living. And waiting to find out what else it has in store for you. While it would undoubtedly make for a fantastic road-trip with friends, some places were meant to be explored in solitude. Death Valley was surely one of them. Is this a journey you are ready to embark on? Check out my previous blog on Great Smoky Mountains National Park and the one coming up on a Road-trip across Spain! You can also follow me on Instagram. Find unreal videos of Death Valley drives on my Insta-Story highlights. Previous Great Smoky Mountains National Park – Are you ready to ‘fall’? Next Road-trip across Spain – else life drives you by. Thanks so much for sharing – we are heading to Death Valley National Park this weekend and will plan to do this! Great post and stunning images.